Four hands, two pianos, two brothers, and excellent instrumental music for the Christmas season. The O'Neill Brothers are a Minnesota institution, hailing from New Prague, a small town rich in historic Bavarian and Bohemian culture. Their accomplished and multi-layered piano presentations have struck a chord with wide audiences, and their solid reputation is well-deserved. 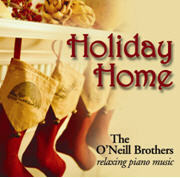 On Holiday Home, the brothers deliver "relaxing piano music," just as the cover promises. When I hear that an album features "relaxing music," I fear that the experience will be "snooze city" or an excuse for lazily-executed fare. That is definitely not the case here. Although Holiday Home is most assuredly relaxing, the music that generates that state of mind is creative, well-crafted, and cleanly performed. The arrangements take the listener to exciting places in familiar territory, with holiday chestnuts such as O Christmas Tree traveling new ground. The O'Neill Brothers really know how to walk that line between predictable restatement and crazy improvisation; their arrangements retain the essence of every well-loved number, but toy with the melody just enough to keep the audience hanging on every note. Nicely done. This is exactly the sort of music you should throw on your sound system when you just need to unwind during the holidays. The offering provides nearly an hour of music, a great window of time within which to contemplate what to buy for that annoying relative who has everything (and/or appreciates nothing). The individual 13 tracks average over 4 minutes each, which allows for rewarding development. By the way, the brothers have invited some talented guests (Adam Maas, Peter Mcguire, Katja Linfeld) to add their sax, violin, and cello voices, respectively, on three cuts, and all are terrific, adding another dimension to the music. I especially loved The Little Drummer Boy, which also happens to be the longest track (5:44); the sax is sublime.